Congressman: Transatlantic Partnership still a matter of crucial importance - Atlantik-Brücke e.V. 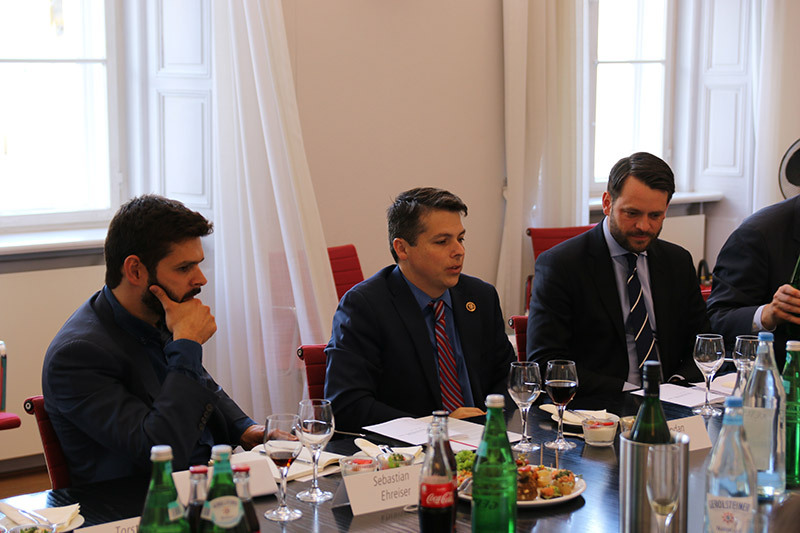 During a dinner-discussion hosted by the Atlantik-Brücke in Berlin, the Democratic Congressman Brendan Boyle assured the importance of the transatlantic partnership. But Boyle, who is a member of the House Committee on Foreign Affairs and has represented Pennsylvania´s 13th Congressional District since 2014, added that this partnership could not be taken for granted anymore. Nevertheless, the current foreign policy position of the White House towards the United States´ European partners is only partly representative since Congress still believes in the outstanding importance of the transatlantic relations. Boyle also talked with around 20 guests about President Donald Trump´s governing style. So far, the president has shown little respect for democratic institutions. But especially the judiciary has kept the White House in check, Boyle stated. Moreover, he regards Trump´s constant attacks on the media, by which the president targets the first amendment too, as “deeply worrying”. These attacks have neither boosted President Trump´s approval ratings nor helped him passing his agenda. Despite Trump´s behavior, only a few Republican Members of Congress have publicly spoken out against the president in order to avoid possible backlashes in their constituencies and states. The discussion group touched on the future strategic focus of the Democratic Party as well. Today, the Democrats are no longer perceived as a “Big Tent Party”, which represents people from all parts of society and throughout the United States. Instead the party brand is mainly associated with the interest of minorities as well as progressive, affluent voters on the East and West Coast. Especially blue-collar Americans feel disconnected from the party nowadays and, therefore, voted for the outside candidate Donald Trump, Boyle said. Hence, the Democrats must try to win these voters back and offer them an alternative. In the end, the message of the Democratic Party for the midterm elections in 2018 and the presidential election in 2020 will also depend on the further course of Trump´s presidency, the Congressman concluded.